Nope...the very skilled wrangler at Ring Lake Ranch. I have been up in Dubois,* north east of here, shooting for the land trust. 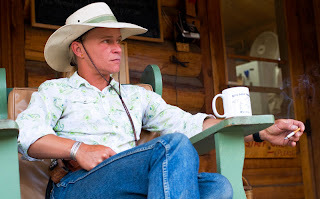 Actually the shoot was east of Dubois 11 miles out back on a hilly winding dirt one lane road with open range. Somehow in dallying around to take this shot the other evening I missed the fact that I would be driving back in to town in the pitch black night. The drive in that direction at that time was no longer 11 but suddenly 110 miles long and STREWN with BLACK cows. Terrifying. All I could think of is JACKSON WOMAN KILLED IN COWCRASH. * locally pronounced as Doo boy. 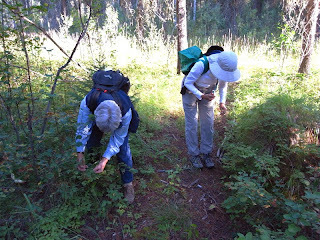 Picking huckleberries is something, it seems, that everybody - especially the women - does here towards the end of summer. I had never been berry picking it but at the invitation of Jean above - who knows ALOT, well, ALL about it - I forged forward into the woods. 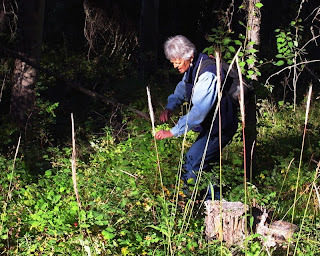 A true Huckleberry Neophyte, ( no explanation for my lack of experience but now I feel like a Real Jackson Woman ) I had much to learn. 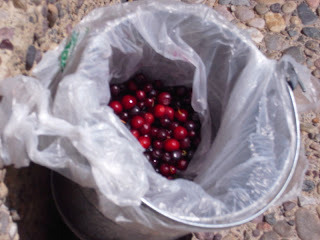 BUT, after 2 hours of picking, I had gathered the above bucket- not-ful. About 1 1/2 C now rest in my freezer. May just stay there as trophy berries. Please click on Jolie's blog at the right for some beautiful pictures of M w V.
When you see the beauty of this valley as displayed here you can understand the picnic habit. 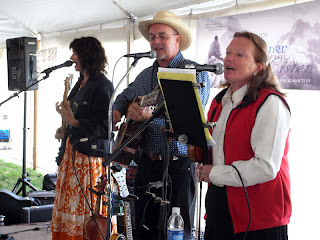 All picnics ( and almost all community events ) have great, great western music. And one thing that makes the picnics so special is the local folk that come. Part of summer here is the tourist season that peaks at the end of July and beginning of August. We shouldn't complain about the traffic and having to wait a light at the Y from time to time, the tourists are an economic necessity. Still, it is pretty savory to get together,complain, eat some chicken and potato salad, opine on the state of the world and the wildlife and support an important community agency at the same time. Remember that line in The Natural when Robert Redford says "God, I love baseball"? I have to say - God, I love Jackson". Last Sunday afternoon was another picnic and another chance for locals to celebrate summer. 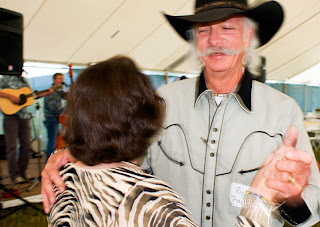 A beautiful granddaughter, one of several, of my friend Suzanne dances at the picnic with her Dad. V and G are now home. Born at 1.7 and 1.8 pounds they now both weigh 4.2 pounds. 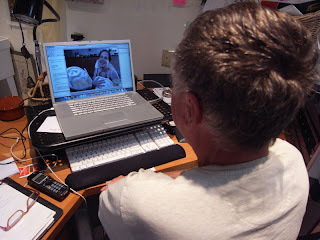 Overjoyed Gammy and Doo Dah watch the homecoming across "the pod" via I Chat. click on jolie's blog to see images. 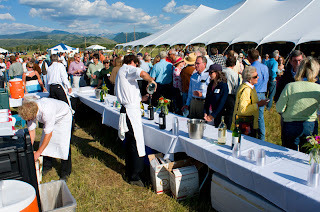 Jackson has a history ( and habit ) of great summer picnics and why not when you are situated under the Tetons and when summer is so short? 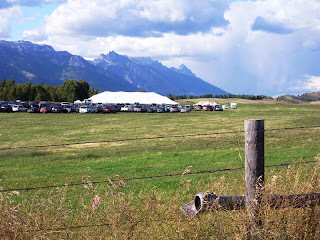 Last Sunday was one of the big ones, the annual Jackson Hole Land Trust picnic. Hundreds of people show up for this event that is frequently called Jackson social event of the year. 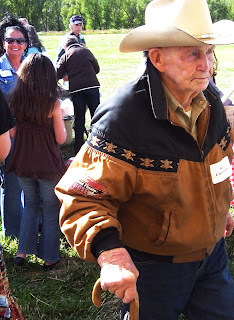 This year's picnic was held on the Hardeman Ranch, the first property put into easement by JHLT. As you can see from the above it was a huge and happy gathering. 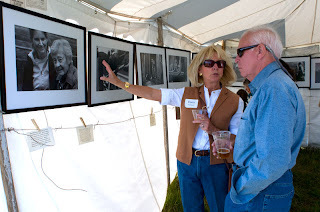 The ranch manager project pictures posted earlier were exhibited in a 15 x 15 tent, hung on a simulated barbwire with text cards cut from brown paper and clipped to the wire by clothes pins. Real picnic stuff! This small exhibit is part of a larger one that will be held at a venue in town in the winter and will then move about town. 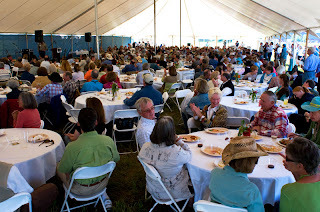 The Land Trust is a much revered agency here in Jackson because, in fact, this beautiful place that demands summer picnics and rewards it's residents with vast and inspiring vistas year round would not look as it does without it. 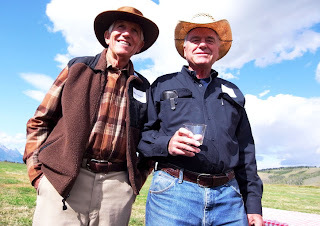 The Land Trust has diligently pursued protection of the land for 30 plus years. I venture to say JHLT is the most important agency in Jackson. It is also one of the most, if not the most, significant Land Trust agencies in the country. I will be shooting more from other counties soon and will continue to tell you about the ranches, the ranchers and to post pictures. I LOVE this project! 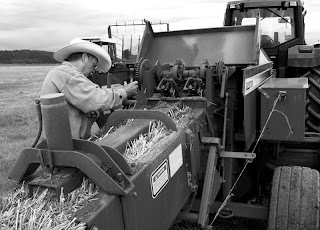 On JH Land trust easements - indeed all over the valley - it is haying time. 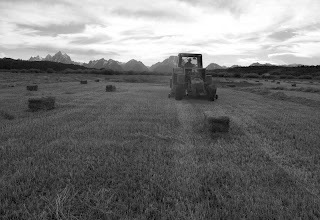 There is only one time here in northern Wyoming when the hay is cut, baled and stored and that time is now. It is a time of weather watching and long hours. 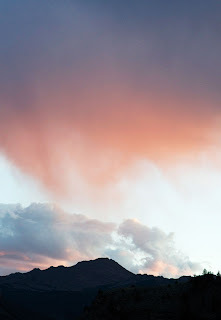 When shooting the above a storm threatened at dusk. 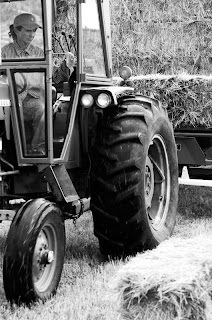 In order to get the cut hay out of the wind rows and flattened so that it might dry quickly if rain did come, work went on until 10:30 pm. The storm arrived the next morning and hung around in various forms for about 5 days. 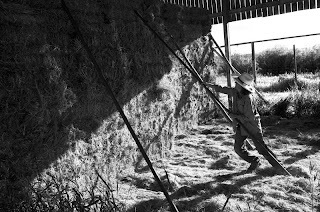 When this happens the hay has to be turned again, flattened again until dry and then, again watching the skies, bales are created and carried off to the hay barn. 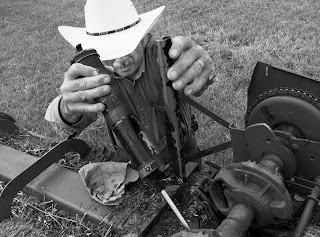 Everybody works on a ranch and the work, it seems, is never done. I wish the first image could be larger here. 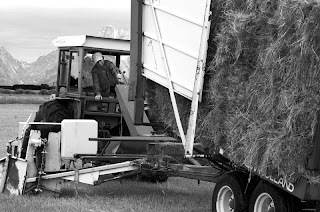 The driver, a beautiful, small and very fit ranch woman is operating that huge equipment. 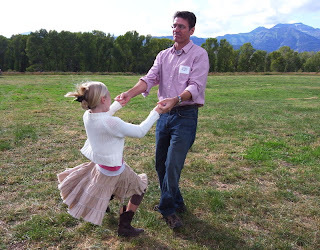 She has grown up on this ranch and every facet of it is also a facet of herself. I hold the greatest admiration for this woman.